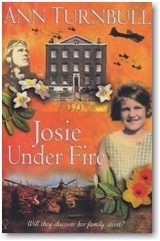 Josie Under Fire is part of The Historical House, a collection of novels by three different writers about the lives of those who have lived down the ages at No. 6, Chelsea Walk, London. To see all the books, visit Usborne's website. The Guardian, ‘Pick of 2004’.